Travelers who fall victim to this mermaid's charms are destined to stay in Užupis forever. 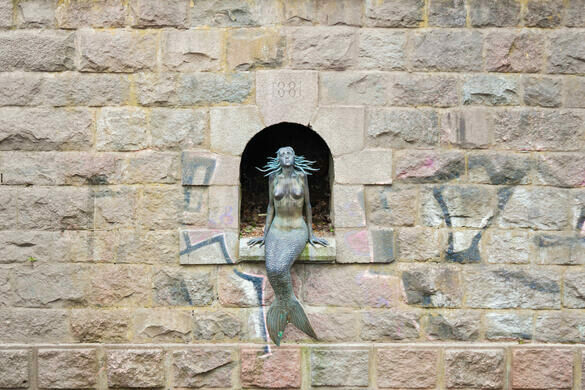 In the Vilnius neighborhood of Užupis—which translates to “place beyond the river”—the statue of a distraught looking mermaid sits on the edge of the Vilnia River. Created by sculptor Romas Vilčiauskas, the little bronze mermaid has become an emblem of the Užupis neighborhood. It has been likened to Copenhagen’s Little Mermaid and is surrounded by the local superstition that those who fail to resist the mermaid’s charms will live out their days in Užupis. Užupis, which is largely located in Vilnius’ Old Town, is a beautiful enclave of history, street art, and historic homes. So, staying in Užupis would not be the worst of fates. The mermaid sits perched in a little brick enclave. Her tail poised ever so slightly to the side, her bare chest exposed to the sun, her snake-like hair seemingly splayed out in all directions like Medusa. It is the mermaid’s facial expression that is the most intriguing. With a look that is at once sad and longing, the mermaid of Užupis almost seems to be begging for company. 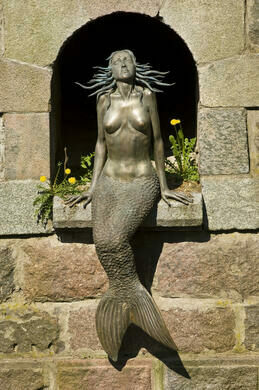 In 2004, the beloved mermaid sculpture was lost to the rising waters of the Vilnia River. Thankfully, the statue was found and restored to its little perch from which travelers and locals alike can see her. The mermaid is said to be a symbol of love, temptation, intuition, hope, and power that attracts travelers from all over the world. The mermaid sculpture is found on the bank of the Vilnia River, near the intersection of Maironio g. and Užupio g.